Original Base 3 1/2 inch solid wood boards run horizontally around the bottom of the chest. This Red Oak chest has a Harvest cushion top and horizontal box style. Beaded Bunn Foot Base 3 inch high and 5 inch round bunn foot with a cut out pattern to run horizontally in a beaded design.. This African Mahogany chest has a Walker style box..
3 inch high and 5 inch round bunn foot with a cut out pattern to run vertically in a reeded design. This African Mahogany chest has a customer's fabric cushion top and Steinitz style box. Standard Base The base of this chest is inside the chest and supports the Aromatic cedar floor so the Box part of the chest sits right on the floor. This Fruit wood stained Ash chest has a Summer Blossom cushion top and 49er style box. 2 inch high and 3 inch round smooth feet screwed into a corner bracket set this chest off the floor. 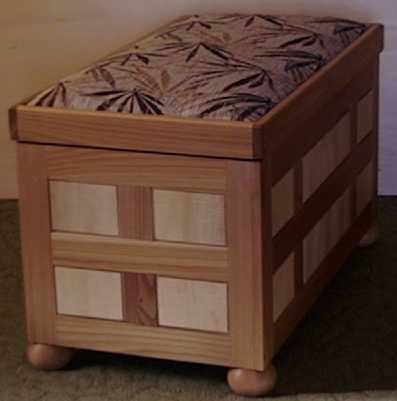 This Red Elm chest with Curly maple panels has a bamboo cushion top and Amanda Style Box. Scroll foot base with classic trim. 3 1/2 inch high scroll cut feet combine with the classic molded trim to lift this chest to a very classy look. This Cherry chest has a triple frame wooden lid and Walker Style Box.